Best Quality Cantaloupe seeds suitable for all occassions. water content, and are relatively low in calories. The health benefits of melon seeeds include kidney disorders, high blood pressure, diabetes, heart care, heat stroke, macular degeneration, impotence, etc. Cantaloupe Seeds we offer is also commonly known as Melon Seeds or Kharbooja Magaz. The Cantaloupe Seed is a rich source of Potassium and Vitamin C. Cantaloupe Seedswe offer are Fat and Cholesterol free, high in water content and relatively low in calories. We bring forth to the esteemed clients a superior variety of Cashew Nuts, Almond Kernels , Shelled Almonds , Green Raisins , Shelled and Unshelled Pistachio , Shelled and Unshelled Walnuts, Manukka, Ash Gourd Seeds , Cantaloupe Seeds , Shelled Pine Nuts, Chironji, Dried Apricot .Dry fruits are hygienically packed so that its freshness is retained for the longer period of time. 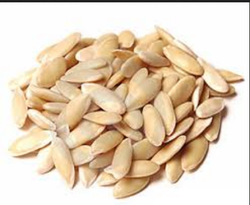 Cantaloupe Seeds we offer is also commonly known as Melon Seeds or Kharbooja Magaz. The Cantaloupe Seed is a rich source of Potassium and Vitamin C. Cantaloupe Seeds we offer are Fat and Cholesterol free, high in water content and relatively low in calories. We make available the Cantaloupe Seed at rock bottom prices within the scheduled time frame. - Procured from Quality centric Melons. - Stored in appropriate temperature. - Packed in hygienic conditions. Our clients can avail from us a wide assortment of Melon Seeds. These are dried, processed and are packed in the best possible manner. The seeds are sourced from the finest quality melons.